In the eighteenth century Grahamston was a village just outside the western boundary of Glasgow. The boundary followed a small stream most often known as St Enoch's Burn. Today St Enoch's Burn flows underground close to Mitchell Street before passing under Argyle Street on its way to the River Clyde. The name Grahamston was given to the area by John Graham the Second of Dougalston. In 1709 John Graham feued about seven acres of land from the Blythswood estate. In relation to today's road system his land ran roughly from Argyle Street north to Gordon Street and from Mitchell Street west to Hope Street. To feu land was to take out an indefinite lease on it. You would make an initial payment and then pay an annual rent. In 1709 a few buildings already existed on John Graham's land. In particular there was a row of single storey thatched cottages on the north side of Argyle Street probably occupied by mautmen. The mautmen were small scale brewers who brewed beer every day and delivered it to houses in the neighbourhood the following day. This information, and much of the other information in this section, comes from Norrie Gilliland's thorough and entertaining book Glasgow's Forgotten Village: The Grahamston Story, Grahamston Publications, 2002. During the eighteenth century more buildings went up in Grahamston, mainly along the northern side of Argyle Street, at that time known as Anderstoun Walk. Most of the area north of Argyle Street was taken up by a number of market gardens. By the middle of the century, however, a few other businesses were starting to become established. Jones's Directory of Glasgow, published in 1749, lists six gardeners at Grahamstone, but also an English merchant, a wright, two wholesale merchants in victual, and a brewer. The brewery, owned by William Buchanan, occupied a site on Argyle Street where the Grant Arms public house now stands. 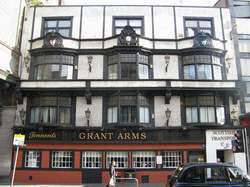 The Grant Arms, at 186-190 Argyle Street, is one of just two buildings known to have survived from the original Grahamston. The site has not always been devoted to alcoholic purposes. Around 1803 the brewery was closed and replaced by a tenement building, but the building was given a new frontage in 1902 and the pub was then created on the ground floor. By 1790 there were buildings of various kinds along the north side of Argyle Street. They appear in a pair of drawings by James Bogle. A version of the drawings taken from Norrie Gilliland's book and showing the location of the present streets running north appears at the foot of this page. At that date the south western part of Grahamston was owned by the Cowan family. On this land there was a brewery known as Milton's brewery, which I take to be the building at the left end of the drawing below. Next to the brewery and behind it were two houses occupied by members of the Cowan family. The brewery and the houses belonging to the Cowans are shown as no. 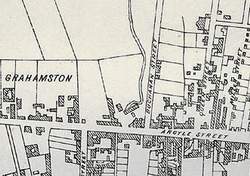 5 and 9 in the map of Grahamston on page 3 of this section. Robert and Andrew Cowan were the two merchants in victual mentioned in the 1749 Glasgow directory. Several of their descendants were prominent in the medical profession. Another Robert Cowan, born in 1768, became a surgeon in Glasgow and according to Norrie Gilliland was also a Professor of Botany. Yet another Robert, born in 1796, was dux at Glasgow Grammar School in 1803. He became a surgeon at the Royal Infirmary in1825 and then a physician at the same hospital in 1836. From 1839 to 1841 he was Professor of Medical Jurisprudence and Forensic Medicine at the University of Glasgow.